I don't know about you, but this week has been CRAZY busy for us! We have had lots of running around and lots of running after my 17 month old baby. He is such a mess! He is in that stage where he is getting into EVERYTHING and climbing on EVERYTHING and playing in the toilet and the toilet paper. He also somehow manages to find markers and draw all over the walls and floor. Soon I will look back on this and laugh:) Right??? Another reason its been so crazy is that a friend of mine introduced me to a little tip, and I have been going CRAZY and cleaning everything in sight!! It is so fabulous, I wanted to share it with you!! This little mixture will clean everything and make baseboards, doors, bath tubs, floors, etc clean and bright! Its amazing! I have been doing a bucket a day! Its so fun... weird, right? But you know...flu season is coming up and you might as well get rid of germs somehow!! 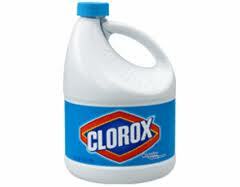 Fill your bucket with HOT water, add the bleach and dish soap. Clean till your hearts content! Anyone else have any fabulous tips? I would love to hear about them, as I'm sure many others would too! And to think how many years I've wasted not knowing this simple little tip!!! Thanks a ton! Happy Thanksgiving. I love your blog!!! It's one of my favorites. I wish more people knew about it!